many women like to wear earrings, but not all kinds of earrings can be the suitable one, check following methods to choose the right kind for yourself. It is better for them to wear stud earrings instead of wear drop earrings; the exaggerated decorative effect produced by earrings is far less than stud earrings. Most earrings will widen the face visual effects, this is because observer's eyes will sweep the entire face if there have earrings. 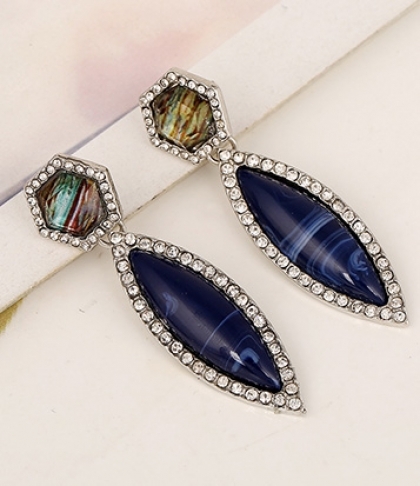 They are suitable to wear chandelier earrings and statement tassels earrings, which should be their daily-wear ornaments. For thin or narrow face, appropriate earrings can play to make up the face shortage, adding beautiful effect. The essentials of face decoration is a little increase of the width of the jaw, resulting in the plump visual effects,Therefore, women with oval shaped face can wear flower-shaped earrings, which make people seem quiet and elegant; they can also wear simple pendant earrings, which will make people seem lively and chic. Please be careful not to wear big round button earrings, because this kind of earrings will make people face deepened the feeling of fullness, the face will look even more round and big then. Women with this face can choose to wear earrings stringed by diamonds, which will make the wearer's face visually lengthen a little. Or to wear small bright solitaire earrings, on the one hand they are small, thus does not increase the width of the face; on the other hand diamond is sparkling, easy to make people's attention focused on the middle of the face, making face narrow.